This proud 1890's 'cigar maker's cottage, just off Duval Street, has been lovingly transformed into a stylish 4 bedroom, 4 bathroom spa villa. Captivated by the uninhibited yet wonderfully elegant Key West island life-style, the designer created a fabulous balance of opposites. Opposites attract because they're not really opposite, but complementary. 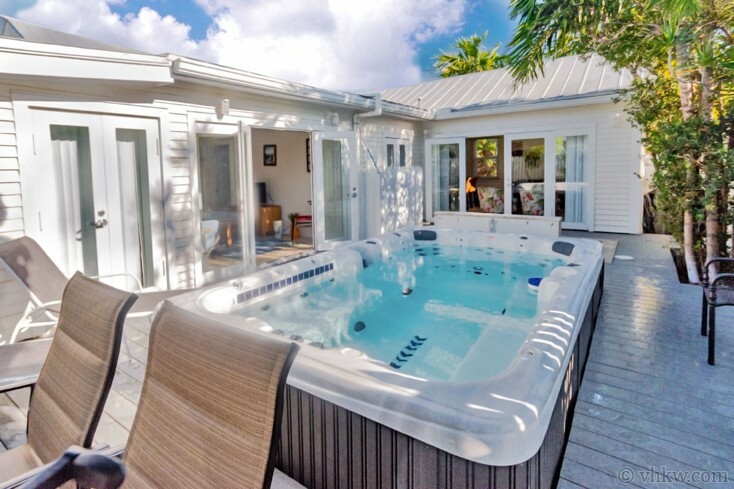 And in this Key West Spa Villa vacation rental you find the perfect complement of a refreshing and relaxing comfort zone just around the corner from the famous Duval Street scene. Located just off Upper Duval Street, this property sits firmly in an historic Key West neighborhood that was originally constructed in the late 1800's as housing for employees of the infamous 'Gato Cigar Factory'. Affectionately known as "Gatoville", it was a bustling little area built by ship carpenters as a hodge-podge of Caribbean style cottages that charm the modern heart. But today it boasts a complete interior renovation, while retaining all the historic charm of the original exterior. For the interior redesign, a local architect created clean modern lines, plenty of light, room to stretch out in comfort, and above all state-of-the-art amenities of a luxury home-away-from-home. Outside is a wonderful cottage spa space with a dipping pool with waterfall, a wooden deck, and a large jetless spa. In the redesign of the floor plan, the entire interior was gutted down to bare bones and then re-framed to take advantage of every bit of available space. 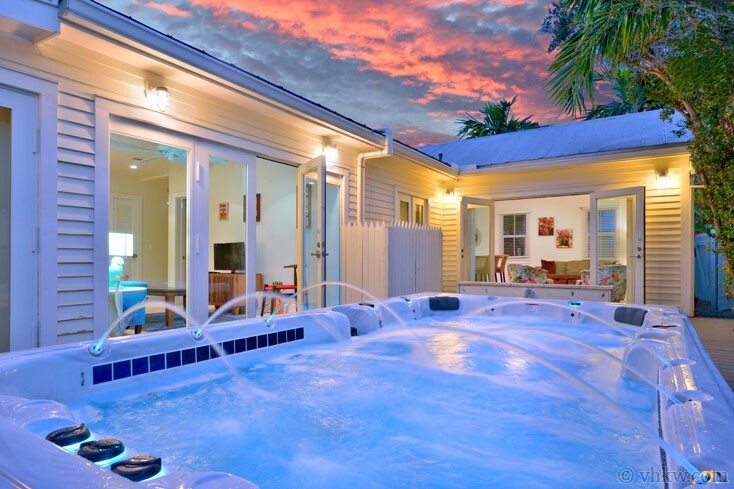 The overall effect is a chic and uplifting Key West Spa Villa. Wherever possible, new siding was fitted snug up to the roof-line creating an uplifting angular chine ceiling. Then, the entire inside was painted a soft pearl white and every floor was redone in a smooth sand-tone tile. The main entrance for the villa leads into a front hall, where you're greeted with an artistic invitation for a mojito or margarita. From there the rooms unfold with only occasional symmetry, their tropical essence playful yet calming. Turn left at the door and you find the great-room, with the living room at the far end and the open kitchen dining area towards the center. One end of the living room features a box frame transom window built right up to the ceiling, designed to capture the sun and frame the lush landscaping in the garden outside. This entire living space is artistically lit up from a variety of windows, recessed designer lighting, and a double set of single pane French doors that lead to the garden spa deck. Then there’s little garden spa deck, off the living room - a masterful creation, and the focal point of the great-room. The dipping pool scene creates a spa ambience that bestows the laid back sophistication of this Key West Spa Villa A trickling waterfall spilling from a blue glass tile backdrop is immediately captivating, and a realistic tortoise sculpture is posed on the deck as a gentle reminder that you're here to unwind and relax. A local interior decorator has hand selected a beautiful grouping of furnishings that balance the relaxed earth tones of the home. Soft textures and sophisticated tropical colors are calming yet vibrant. The cushy sofa is the perfect place to curl up and read, gaze at the spa garden, or watch a movie after a soak in the dipping pool. The living room transitions to the kitchen side of the great-room from a granite top dining island and prep sink. The kitchen is roomy, and the amenities are high end. Textures and subtle hues of greens, blues, tans, and silver set a tone of sophistication. The glistening glass-tile back splash and thick granite counter tops are handsomely combined to echo a palate of plaid and tweed. State-of-the-art stainless steel appliances, crisp white cabinets, and designer woven-back bar stools make a clear statement of luxury. Down the hall from the kitchen, on the opposite end of the cottage, we find the first two bedrooms and bathrooms. The architect artistically blended features of different eras and gave each bedroom a special feature. First, take the very roomy front master bedroom. Opposite the bedroom entrance, an exterior door leads outside to an unexpected sitting porch. But once outside, you realize that in another era, the sitting porch was the original entrance to the villa, and the front master bedroom was the original living room! In the first renovation of the floor plan, the front master bedroom also got a beautiful private en-suite bathroom. Sage green brick-shaped tile, an ebony river-stone fashion stripe, and pewter tone counter top, feel spa-like and modern. The shower was built oversized so two can enjoy it at once, and the custom frameless clear glass shower doors and designer bath fixtures complete the upscale look. Furnishings for the front master bedroom are traditionally tropical, of white wicker complemented with earth tone designer table lamps. In our slide show, a colorful rainbow tone striped bedspread tops the king-size bed, and a flat screen TV and DVD player are set on the dresser for easy viewing. Back out into the hallway off the master bedroom, you are lead down the other side of the villa towards the back of the house. Along the way, you pass the laundry center that is tucked neatly into a closet for easy access. Across from the laundry closet appears the second bathroom. This bathroom is equally as beautiful as the master bathroom and repeats many of the luxury spa themes and designer fixtures, only in its own unique color palate and style. Here the brick shaped tiles are sand-tone in color and the river-rock fashion stripe uses blue tones rather than ebony. This bathroom also has a bath tub, and is enclosed with the same custom frameless clear glass shower doors featured in the master bath. The second bedroom is located just a few steps down the hall from the bathroom on the left side, and like the front master bedroom the architect created its own unique and unexpected feature. This time it's your own private single pane French door leading outside to the dipping pool and spa garden. 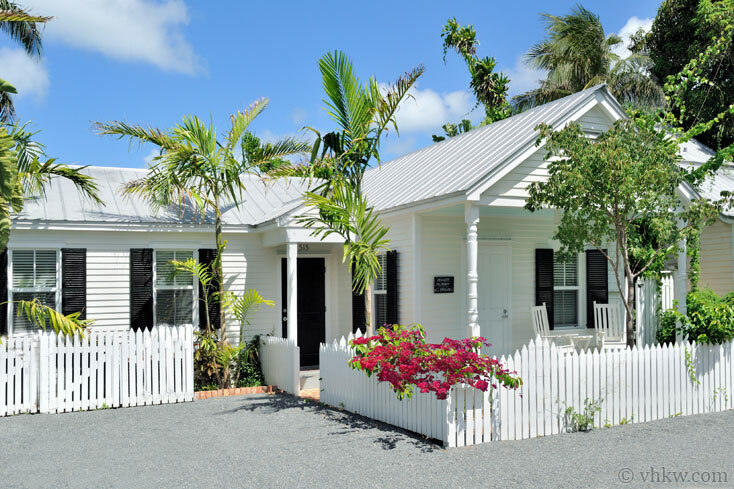 Furnishings reflect the essence of Key West cottage-style all the way. Bright yellow is trimmed in brilliant white that make the bedroom feel jazzy and sun filled. Two twin beds are set so they can be easily placed together to make a king size bed. Continuing down the hall we find a spacious media room, the third and fourth bedrooms, two bathrooms, a deck and a large in-deck Jacuzzi tub. The media room is casual and elegant, full of sunlight that is invited through a double set of single-pane French doors that lead to the deck outside. Continuing with the tropical theme, this room is designed for luxuriating spa comfort, island style. Bedroom three offers two twin beds done in dark tropical woods and modern furniture accents. A sash window invites in the sunshine, and has a nice view of the spa deck. A handsome tile and granite bathroom with oversized shower with frameless glass doors just out the door to the right. Bedroom four, situated at the back of the house, provides the second master bedroom for the villa with en-suite bathroom and king size bed. Also done in tropical modern, the back master bedroom blends dark woods and sea-grass furnishings for a classic tropical chic effect. A wonderful feature of this bedroom is the glass doors with a view that lead directly out to the deck, just steps away from the Jacuzzi tub, a quintessential feature of an authentic, yet modern, Key West cottage style villa. It’s usually the unique settings we experience that are the most delightful, and in this case it's the spa garden and dipping pool adjoining the cottage great room plus in-deck jetless spa. Landscaped and manicured, it may not be a full-size swimming pool, but combined with an in-deck spa it's really all you'll need to unwind, relax, and renew. 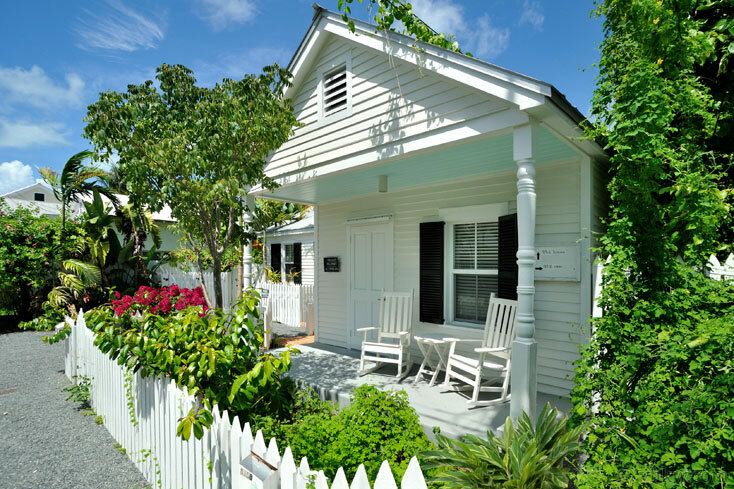 Everything about the front yard is pure Key West from the white picket fence, to the lathed porch posts, to the silver tin roof, to the traditional wooden shutters. A professionally landscaped garden is balanced with a picturesque landscape of palm trees, native plants, and tropical foliage. A revered Key West feature is the private off-street parking for one car located directly in front of the house. When you rent this villa, lounging beside the spa garden puts a whole new spin on things. 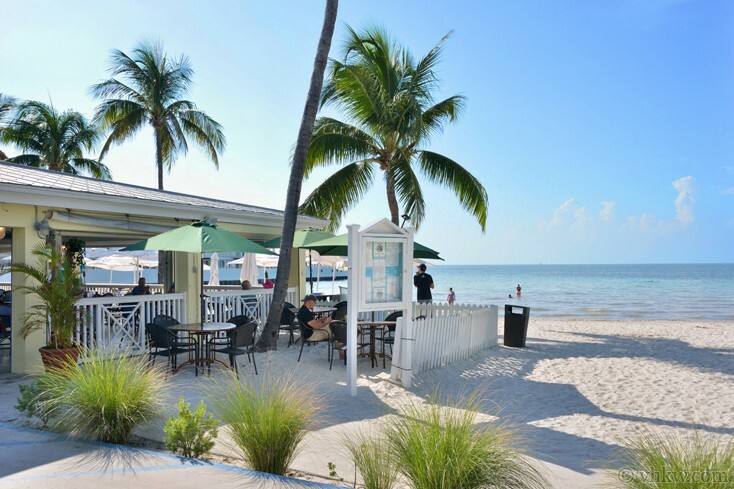 And when you're ready to take in Duval St., all you need to do is walk around the corner where you'll find the most happening night life, the finest local art galleries, locally owned boutiques, the Butterfly Conservatory, South Beach Key West, and some of the best Key West restaurants on the island. View a floor plan of the property here by clicking here. Amenities: Dipping pool with spa garden and trickling waterfall, large in-deck Jacuzzi tub (jetless), private deck. Tropical landscaping, front porch with rocking chairs, privacy fences. Fully equipped designer kitchen, media room. Central a/c, internet, color flat-screen TV, stereo, washer / dryer. Linens and towels are provided. Maid service can be scheduled. Parking: Private off-street parking for 1 car only at entrance to the property. If you arrive by car, please plan to park it in your private parking space and forget about it. Enjoy walking or biking around the island. 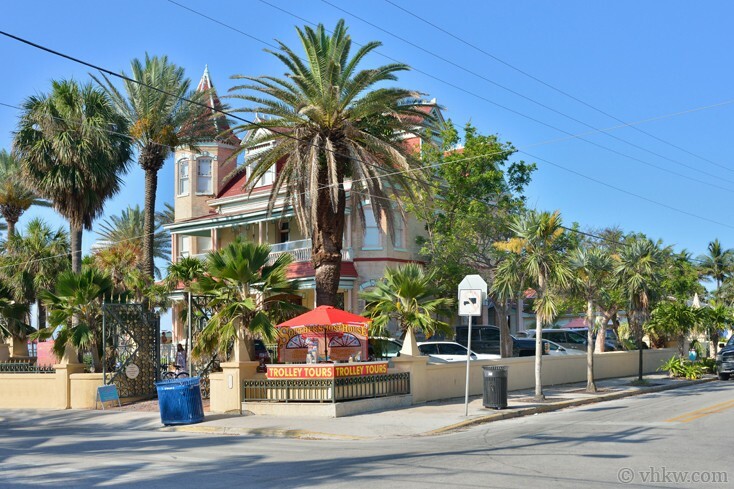 Activities: Elegant Upper Duval St. - Close to the Southern Most Point of the United States. Cafe neighborhood features art galleries, wonderful eateries and internationally famous fine restaurants, coffee house, fine gift and clothing stores, "Grand Vin" wine tasting, "Flamingo Crossing" home made ice cream, "Banana Cafe" French food restaurant, La-T-Da restaurant, bars and entertainment destination. 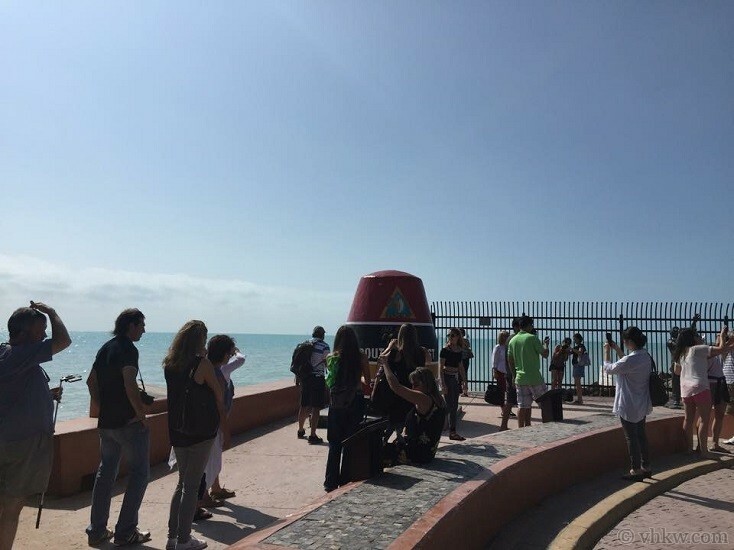 Here you start at the top of Duval St. near the Atlantic Ocean and can take the 20 min stroll to the Gulf of Mexico (remember it takes 3 to 4 Key West streets to equal the distance of a typical city block). Restrictions: Smoke free property. Smoking permitted outside only. No pets. (Please don't ask!) This home is offered as an exclusive vacation rental in the most requested location in Key West. We do not accept guests less than 25 years of age unless accompanied by a family group or guardian. Nov 16, 2020 - Nov 19, 2020 $4675 $975 4 night min. or 3 night min. 60 days prior to arrival. Loved our stay at the spa/villa on Louisa Street. VHKW is a first class vacation rental Co. The home was just as it was described and pictured. Clean, well maintained and stocked with essentials Super nice personnel in office , (Paige and Teo) made check in and out easy. Great info provided before our trip and correspondance per email was timely and precise. Rules were reasonable and adaquate instructions were provided at the house. We have rented homes from many companies that fall far below the level of service from your Company. Thanks for making our vacation such a great experience! I have no suggestions for improvements! Lovely house, perfect location! Three couples were quite comfortable here. We liked having three private en-suite bathrooms. We didn’t need to rent a car as the Duval Loop bus stop was a 2 minute walk. Only a half block to a fabulous French bakery, top notch Italian restaurant and a French inspired cafe. Many other shops, watering holes and restaurants are within easy walking distance. Will certainly stay here again on future Key West visits. Awesome place and great bedroom and bath set up! Celebrated 60th Birthday with brothers and wives and we loved it! So close to Duvall. Cannot wait to go back! Absolutely fabulous home! Celebrated 60th Birthday with family! Each of us got our own room with comfy bed and bath! Spotless! And perfect area...to get on Duvall Street! Will return! Great customer service, very helpful and very responsive: thank you so much! Thank you for making our vacation to Key West outstanding! Thank you for the recommendation on the home, the wonderfully friendly and attentive service and perfect accommodations for our group of 8. Thank you also for the nice touch of the birthday balloon and card for my big day, How thoughtful! I would highly recommend booking your vacation home with VHKW. Great setup for the house. Clean. Good parking. Convenient location. Would definitely stay here again. We had a very nice stay and enjoyed all the facilities at the house. I would recommend a table for at least six somewhere inside near the kitchen. Outdoor sun does not make it conducive to sit outside during the heat of the day for a meal. Great location and layout of the house. I would definitely rent this home again. 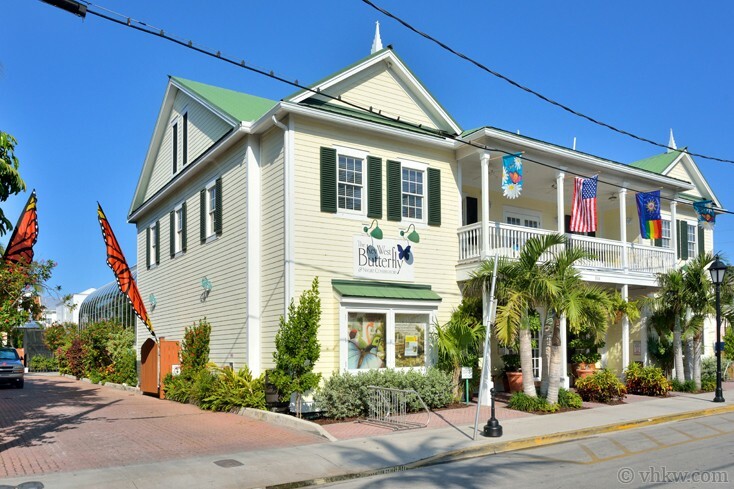 Great home for a your Key West trip! 1/2 block off Duval, but most important well stocked and well planned floor plan for 8 people, the other 2 on a pull out sofa! Highly recommended! Had a group of 10 stay at the house. The pool/spa area was a great place to chill. Walking distance to everything. Interior is a nice size, easily accommodated our group. VHKW was very accommodating as well. Would definitely stay there again. The house was everything we hoped for. Nicely kept, spacious and comfortable. 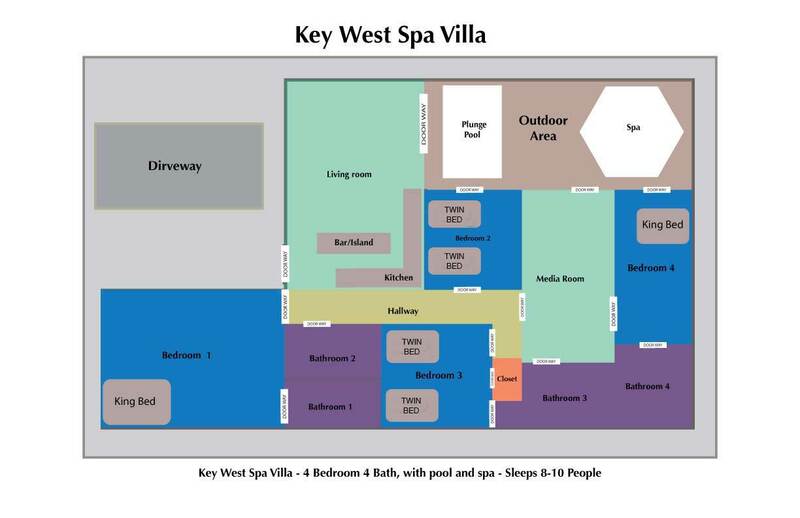 I would recommend Key West Spa Villa to anyone wishing to rent 2 to 4 bedrooms. Also, I called VHKW a couple of times with questions and I always a positive answer in a timely manner. The house we rented in Key West was amazing. Roomy enough for 10 ladies. We thoroughly enjoyed ourselves. The location was ideal for everything we wanted to do. We walked everywhere. Thank you so much for helping us make lasting memories. Very nice place,clean!Everything I expected and more!I would use key west homes again. House was beautiful and fit our group well. Great location ! The home is excellent for a large family. The pool and deck area are much smaller than they appear in the pictures but worked out perfectly. 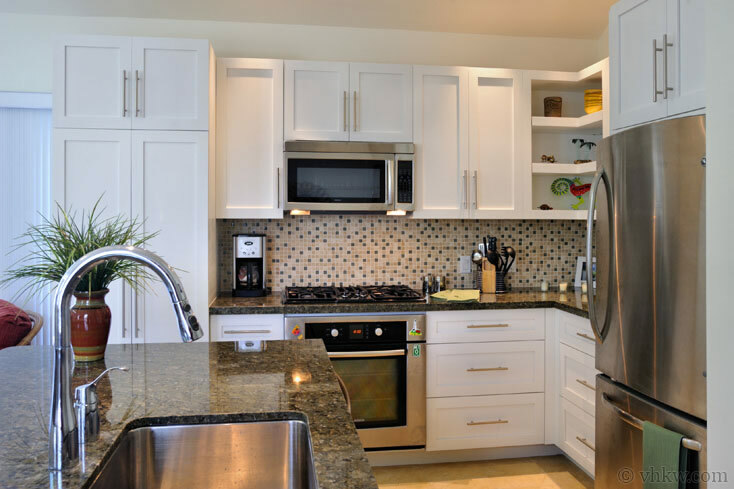 We were very satisfied with Vacation Homes of Key West and our accommodations. The company Vacation Homes of Key West was fabulous. We were very pleased with our rental home. Your description and pictures were spot on. We would definitely rent it again. We will recommend your website whenever we can. Very good! Answered all our questions, quick to respond with follow ups. Paige was great with concierge needs. Will definitely use VHKW again. I booked through Vacation Homes of Key West for my wife's 50th birthday. From start to finish the staff were so helpful in advice, recommendations and thoughts to which property would fit our needs best. They were SPOT ON!!! The property was perfect, the location couldn't have been any better and the cost in relation to a hotel was comparable. WE will be back and we will use Vacation Homes of Key West again!!!!!! Very roomy and updated home. The house was right in the center of everything! It was walking distance to great restaurants on Duval street, but surprisingly quiet. We liked the two separate living spaces, which allowed people to spread out. I highly recommend this home. Everything was perfect!! Clean house and we were allowed early arrival which was really accommodating to our schedule. I would highly recommend using Vacation Homes of Key West in the future. Great place!! Great Location!! Everyone had a fantastic time. Thank you very much! !